Have you been watching The Marvelous Mrs. Maisel? We have too. It’s a show with undeniable style, and we’re hooked on the costumes, the jokes, and the interior designs. Lately, we’ve been tempted to add some Midge Maisel flair to our home decor, which is why we’ve rounded up some of our favorite mid-century-modern-inspired picks, from chairs to lamps to pillows. While not all strictly sixties, these styles are similar to furniture and accessories we’ve spied while watching the show, and we have to tell you: We can’t get enough. These designs would fit seamlessly into the world of the show, and they’re sure to look fabulous in your home too. And if you haven’t yet watched the Golden Globe-winning show (Best Musical or Comedy TV Series and Best Actress in a Musical or Comedy TV Series)—what are you waiting for? We’re counting down the days to the second season, because it promises to bring a fascinating new storyline to get lost in as well as gorgeous mid-century interiors to swoon over. Win-win! Tall white-and-gold table lamps are all over the Mrs. Maisel designscape. Similarly, glossy white geometric lamps are in abundant supply. Accent chairs in blush and blue shades add interest to previously empty corners. Your sofas are just begging for a few gorgeous round pillows, aren’t they? No mid-century living room is complete without a stylish buffet—make the design work for you by implementing it in the form of a look-alike TV stand. This chair offers a subtle way to incorporate a retro style into your current design. 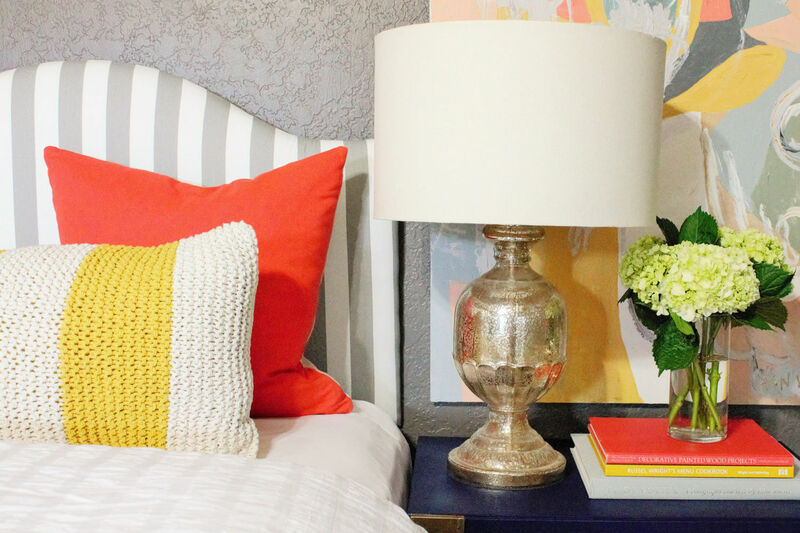 If your color palette is full of solids, add some flair with floral-patterned pillows. If you’re not into the multi-bulb sconces and teeny shades found in Midge Maisel’s world, opt for these sleeker brass ones. A bright red-orange ottoman with a golden base adds an unexpected (but always welcome) pop of vibrant color. This splurge chair incorporates a bold floral pattern with undeniable personality.